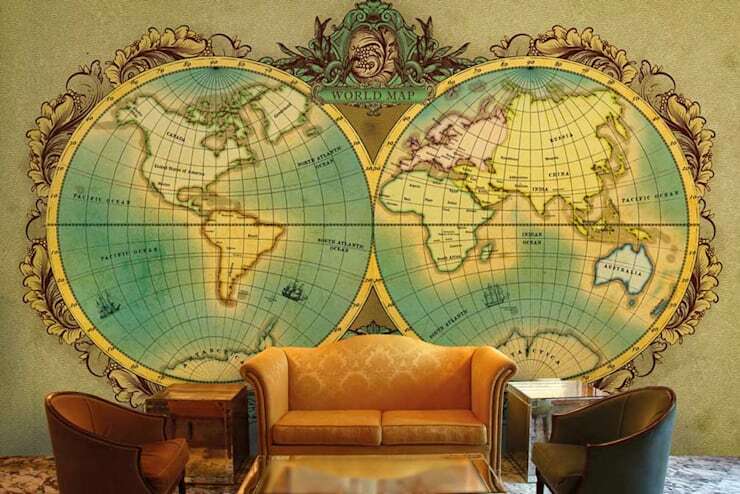 "Show your love for travel and exploration using world map wallpaper ideas. Our custom wallpaper maker option helps you to make your own custom wallpaper for home and office decor. Retro wallpaper designs and vintage textured wallpaper pattern creates mystique around world map wall paper. Modern wallpaper maker prefers to create digital and hi-tech aura in world map wallpapers using dark blue wallpaper patterns and digital effects to show world and communications. These world map wallpapers are preferred by interior designers for modern wall decor. #World Map Wallpaper for Living room#World Map Wallpaper for Bedroom#World Map Wallpaper and Murals for Wall#World Map Wallpaper and Murals for home#World Map Wallpaper printhing.